The overnight rains had added a nip in the air! The small droplets of water on the surrounding trees glistened in the morning sunrays like pearls studded on the twigs and leaves. The red coffee seeds in clusters looked very pretty in the thick bushes. The chirp of birds made the surroundings absolutely heavenly. We headed through the long winding road towards the market. 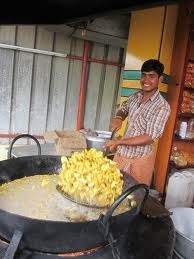 The aroma of banana chips frying in the huge cauldron was a very tempting sight and was attracting us towards it like opposite pole of a magnet! Soon we were in the midst of the busy market with tourists making a beeline to the adjoining shops. As you take a walk along the streets of Thekkady, in Kerala, one thing that strikes you first is the lingering aroma in the air. The scent of cloves, nutmeg, pepper, cinnamon or cardamom and sometimes a fragrance that combines the scents of two or more spices. Soon we landed in one of the shops and were amazed to see the number of varieties of handmade soaps with fragrances of jasmine, sandalwood, rose, and every possible exotic flower, neatly wrapped in betel nut leaf. The shopkeeper was very friendly and on our inquiry suggested that he could arrange a visit to one of the Spice Gardens. An auto rickshaw arrived and we set off for visit to the Spice Garden, a short drive of 4 km from the town. Every other house has a Spice Garden in the backyard where coffee plantations, cardamom, cinnamon, vanilla and many more play hide and seek with visitors. The owner of the place took us on a conducted tour. The air was fresh with the fragrant smell of black pepper, cardamom, cloves, peppercorn, long pepper, nutmeg, star anise, mace, cinnamon, ginger and at least a dozen more plants. There are many factors that make the plantation experience a memorable one. For some, it could be the unassuming beauty of the tiny flowers of the cardamom that grow at the base of the plant; for others, the tantalizing aroma of cinnamon or cloves, and for some others, the cool breeze that lovingly strokes the green plantations and everything in it. It was the first time in my life that I tasted fresh seeds of green cardamom plucked and ginger pulled out from the soil and washed. I even tasted a Garam masala leaf which had been created by cross pollination of five varieties of spices. The pristine experience tingled the taste buds! The pepper plantations are worth seeing. The sunlight seeping through the shapely leaves of the pepper plants is an alluring sight. The geographical and climatic peculiarities of Kumily and Thekkady region, like the cool climate and its elevation from the sea level make it ideal for spice cultivation. Besides the spices one cannot miss the banana and coconut plantations filling the gaps of land! It is a great feeling to get up at dawn in the lap of Nature, smelling the fresh, aromatic air - almost like waking up in a green paradise that is far removed from our flawed planet. Apart from being enjoyable, these plantation tours give tourists an insight into the growing, harvesting and processing of spices. The peeling and drying of cinnamon and the painstaking task of hand-pollination of vanilla can be observed. Various parts of the plant like the dried seed, the fruit, the root, the bark and the vegetative substance are used in the industries of cosmetics and perfumery. Some spices like turmeric have high medicinal value and also have an important place in Hindu religious rituals. Garlic and ginger are two other spices that have medicinal value. They are also used as preservatives. Godrej, a leader in the Indian perfumes and sprays could consider using some of the derivatives of these spices to add to their existing range of products and also consider manufacture of ‘Pepper Sprays’ to protect the women folk and prepare them against impending danger from those who have an evil eye! Beautiful description Rahul and pics i had never seen before.It must be heavenly to breath all those aromas. Thanks a lot Induji, for liking and your kind wishes! I have never visited a plantation, sound like an interesting think to do! True Francesca,a visit to natural surroundings is a bliss! Thank you, Radhika for reading! I am seeing the cardamom plant and the cinnamon bark for the first time in life ..
thank you for all the info rahul sir.. Thanks a lot Bikram ! It was a sheer bliss to visit the place! Your narration took me there virtually. Banana chips reminds me bread pakoras and tea in any roadside stall in HP. I have to go there to feel this amazing potpourri. A huge thanks Saru, that I could take you on a virtual trip:) I Too have enjoyed the bliss of bread pakoras and hot tea on way to my trips in Himachal to Kullu, Manali,and many other places:) My memories were refreshed! A great experience indeed, Agnes! Indeed lucky to have visited such an amazing place, Mr Chowla! Thanks for reading! I had been to coffee plantations where pepper creepers also could be seen. The Coffee fruit looked beautiful. I will definitely visit these spice gardens when I go to Kerala next time. I felt so proud after reading this. Thanks Bindu! Agree with what you say! Vibrant narrative. 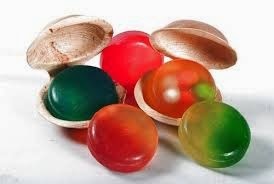 The pic of hand made soaps is interesting. Thanks a lot Alka, for your kind words! Banana chips? I've never heard of it. I loved the place. Nature is fantastic. If I had money I would go there. But one day I will have (?, Aad then I'm going to visit this wonder! Sure Camila, it is worth seeing like many places in your part of the world!Thanks for reading! Yummy fragrances! I love the smell of coffee and vanilla. Thanks Rachna! Nothing to beat natural fragrances! I could identify with it as even I have been to Kerala. Fresh Banana Chips are yummy! Thanks a lot Anita for reading! See even for fragrances you have to talk about food :) That's not fair Rahul sir.You went to the trip without telling us. I would have given you the big list for soaps and spices :P.
Never seen these plants anywhere. Even on Google :) Breathing the suffocating southern air, you made long for that fresh crisp kerala weather. How nice to see you again, Latha! Ha ha ... don't worry I have got the spices for you and will make sure to give you your share when we meet:) Those pics were taken by me so thanks again for having liked! 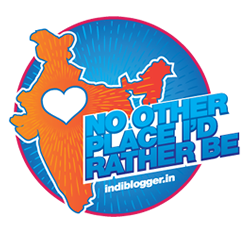 Do keep blogging as am missing your absence from the blog world! Looking forward to read your new posts! Take care!